Wedding budget recommendations: 45% for the reception (venue & food), 18% for photography and video, 15% for florals and décor, 10% for planner, 6% for paper goods, 4% for entertainment and 2% for miscellaneous. Choose the wedding place. Hopefully Costa Rica! The day before, go to bed early and be prepared for the big day! Getting married is one of the most exciting moments of your life and while you plan this day, you will experience days full of joy. But we cannot lie to you; organizing a ceremony can be a little bit stressful and sometimes you will experience confusion…even more if your plan is getting married in a foreign country. 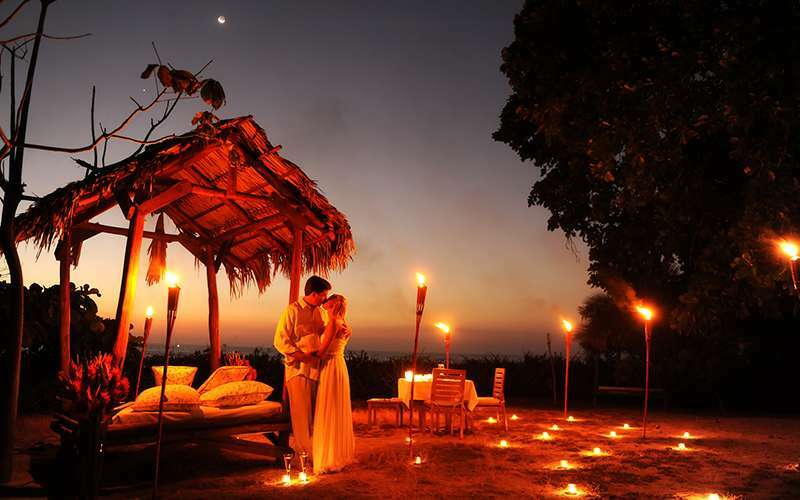 If you are looking for the perfect dream location for your wedding, look no further... Costa Rica is the place where dream weddings become reality and Travel Excellence is the weddings expert you are looking for. Costa Rica wedding locations are unique. This the only place in the world with amazing and ideal spots for weddings in the rain forest, the cloud forest, the dry forest, beaches on the Pacific Ocean and the Caribbean Sea, tropical gardens, waterfalls, hot springs, mangroves, plains, rivers, lakes and volcanoes. Whether you are seeking a beach wedding on a perfect sunset or a lush tropical setting in the rainforest, the country will provide you the perfect backdrop for this memorable day. This perfect wedding destination is rich with picturesque locations and magical settings that will ensure your wedding day will be remembered for a lifetime. The country is full of unique venues for weddings. 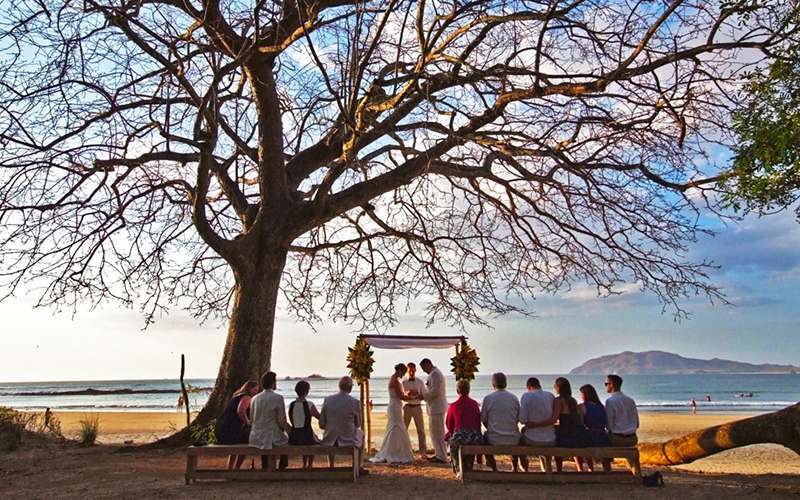 The pristine Costa Rica beaches, forests and city sceneries are some of the perfect wedding locations that will realize the dream of an unforgettable ceremony. Here you have a destination with something to please everyone. Centrally located in the continent, you could combine a holiday with friends and family; your wedding ceremony; and your magical honeymoon, all in one stress-free visit. An important fact to take into account when choosing the perfect spot to celebrate your wedding is the Costa Rica weather where rainy season goes from May to October. Juan Santamaria International Airport is located in the Central Valley making this place a perfect wedding destination. Some of the benefits of choosing a Central Valley venue are: you won't have to think in long transfers for your family and friends and it is a place is full of attractions to visit as volcanoes, museums and theaters, coffee plantations and handicraft shops. In both, Central and Northern Pacific, you will find unique wedding venues for your celebration. Guanacaste Costa Rica in the Northern Pacific is a land of beautiful landscapes made up of bays, gulfs, hills splattered with forests and cliffs, panoramic routes, volcanoes, wild rivers, beautiful beaches of gray, fine dark, white and golden sands bathed by a blue sea of clear waters, with mainly gentle waves and rich in fishes and seashore birds. This is also the perfect place for all-inclusive Costa Rica weddings as here is where most of the all-inclusive resorts of the country are located. The Central Pacific is home to the world-famous Manuel Antonio National Park, a lush rainforest reserve packed with indigenous wildlife. But beyond that, it's also one of the places in the country where the jungle literally tumbles onto miles of Costa Rica white sand beaches and clear waters. The countryside venues offer landscapes of exceptional beauty with its forests, lagoons, fields of crops, rivers and hot springs. In other words, sanctuaries where you can breathe peace, purity and the majestic power of nature. Here are located some of the best wedding locations and the most romantic wedding venues of the country, specifically located in the Northern region of the country in Arenal La Fortuna Costa Rica. This is to give you all the information that will help you make the right choices for your wedding day and to remain in constant contact throughout the entire planning process from concept to realization. So, upon your initial enquiry, you will receive a wedding questionnaire that will give us the detailed information that we need to create a proposal and initial budget for you. 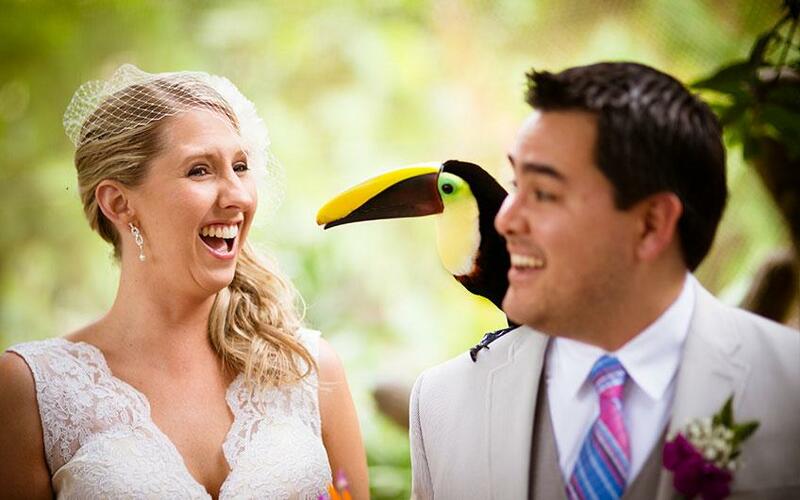 From that moment onwards, you will be introduced to your personal Costa Rica wedding planner, who will be your direct point of contact right up to the wedding day. This person will happily answer all of your questions, enquiries and generally help you in any possible way. An initial deposit (non-refundable) secures the date of your choice and confirms our services as wedding planners and then, the actual planning can begin. You will receive more comprehensive information about the choices available in relation to the flowers, vows, menus and all the other details that will come together to create a wedding day that is totally unique to you. The wedding planner will discuss and confirm all the final details of the wedding with you and go through the order of service. The final balance is sent to you and payment deadlines and conditions will be indicated once all suppliers involved have sent us written confirmations of the contracted services. Payments' due dates and amounts will be subject to conditions given by suppliers. A pre-wedding meeting is recommended a few days before the wedding, so you can finally meet your wedding planner face to face. This will be a great opportunity to do a last revision of all services contracted and it is highly recommended, so please take this into consideration when planning the dates of your trip to Costa Rica. On the day of the wedding, the entire team will be there to help and make sure that everything goes as planned. Your wedding planner will meet you at your hotel and go with you to the wedding venue to ensure every detail is taken care of. The rest of the team will be there early to complete the set up. Throughout the entire planning process your planner will share all correspondence with other staff members, so that they all know as much as possible in the run up to your wedding. Working this way ensures that every member of the team knows what should be happening and any queries can be resolved well in advance of the actual wedding day. 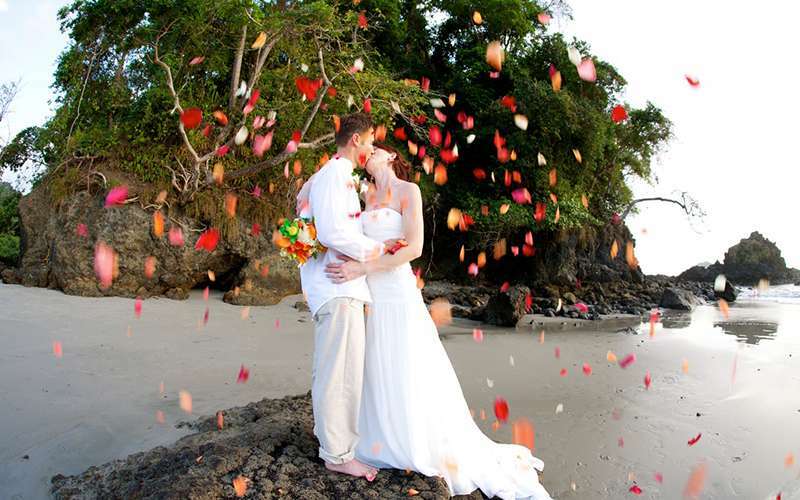 Travel Excellence has been successfully organizing Costa Rica weddings since 1996 and, in that time, we have expanded from a team of 4 people to more than 50. Everyone has an important role to play in creating your perfect wedding day. 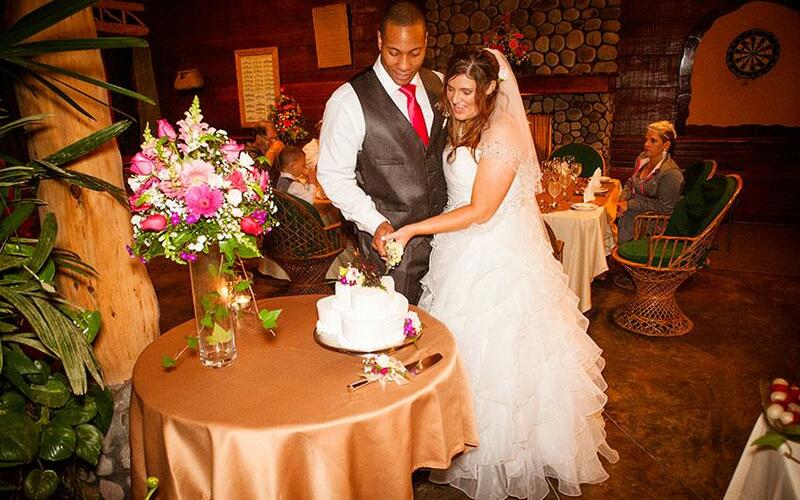 The weddings we create are meticulously planned and we take care of every wedding requirement the bride may have. Each ceremony is as special to us as the last. Every team member strives to work hard and is professional, experienced and most importantly, friendly. The knowledge we gain from every wedding will give you the confidence that, as well as ensuring that everything goes as the wedding planning timeline, our presence will also add to the enjoyment of the occasion. After all, we are there for you, to take care of everything and to help you making this day special and memorable. Travel Excellence, as your wedding planner, can organize everything other than the ceremony, including pre-wedding activities (i.e. bachelor parties and activities, rehearsal dinner, and brunch), all aspects of the wedding day and reception, accommodation for you and your guests, restaurant reservations and food tastings, the domestic flights if needed, Costa Rica tours, pre and post-wedding parties and Costa Rica honeymoon activities. There is almost impossible to tell you how much your wedding cost will be as the price will depend on the details and every wedding has their special touch. What we can tell you is that in US, the average wedding cost is $30,000 approximately and the expenses in destination weddings usually are lower than a traditional wedding as there are so many affordable wedding venues where you can choose. The wedding planner and all the team will be attending to the wedding in order to handle every last-minute detail or request you may have. Your wedding planner is exclusive and will not be in charge of any other wedding so will never be unavailable through other work commitments. In the event of sickness, our wedding planners work very closely and all emails and information from telephone calls and the interactive tools regarding the wedding, are available for another planner and the whole wedding planning team to pick-up the reins smoothly in case of any emergency. We have a permanent team of more than 50 people distributed in the areas of marketing, product development, operations, sales, quality, ITS, and our expert wedding planners. All of them have a role to play and attend every wedding based on the services you contracted. In addition to our own permanent wedding staff, we also have floristry suppliers, the catering team and other outsourcings as transportation companies, hotels and specialized services such as Costa Rica wedding photography and video producers. Any person or company we use has been hand selected to ensure that the highest standards are maintained. You can have the greatest wedding planner in the world but if the staff members they are working with are lacking wedding experience then you undoubtedly will face some problems. Our specialists, as described above, do weddings and nothing else. Whether you choose an all-inclusive beach wedding in Costa Rica at a natural venue or at one of our recommended properties, it is one of our team members who will be in control. You can be sure of the professionalism of our company by the speed and the detail of any responses you receive. This will show you that someone is actually at the other side of the computer taking care of your wedding requirements and responding (not relying solely on automated messages which of course play a useful role in confirming receipt). Also, we are members of local and international associations and Costa Rica Tourism Board licenses us. We will give you different payment methods depending on your wedding cost, bank transfers, deposits on an account at CHASE bank (for US residents), and payments via check. You can choose the option that best works for you. We have many ideas and we will let you choose from numerous wedding locations and examples or flower designs, color schemes, music, vows, wedding favors and so on. Each of our wedding packages is a completely unique experience. (Also, you can check our leisure Costa Rica vacation packages to learn more about locations, activities and destinations to choose from for your special day). We only work with prestigious suppliers and venues, where all weddings are exclusively organized by us. Relationships with the suppliers are based on the concept that we are in control of the wedding requirements with the support of the venue staff. With the number of mixed (interfaith) or non-religious marriages taking place, many couples today are opting to have a secular ceremony for their wedding. This allows them to include special readings, vows, symbols or wedding themes that they may not be able to include in a religious ceremony. The wedding location for a secular ceremony will be your choice, as it contains no religious elements. Secular ceremonies also tend to be the favorite of the budget conscious couple, as they are usually much cheaper in the long run then a formal religious service. All in all, a secular ceremony is much more flexible in today's world. You both may write your own vows and have any type of wedding theme you want, whereas a typical religious ceremony tends to restrict much of this. You can supply your own entirely original vows if you wish. Typically and most practically, an introduction by your celebrant begins the ceremony, followed by the recitation of your vows, and then the exchange of rings. Finally, the celebrant will declare you husband and wife, though this is a purely personal affirmation, as the legalities of your marriage will be handled separately. If you are planning to make your marriage legal with us here in Costa Rica, you might choose to have the officiating (signing of the documents) immediately following the ceremony. Exchange marriage vows in a quaint church in the tropical paradise: Costa Rica; and combine the solemnity and sincerity of a Catholic wedding mass with the beautiful setting of a private wedding reception at any of the special venues for weddings available in the country. Let your marriage be blessed in this most spiritual of wedding ceremonies, combined with the intimacy of having your dinner reception at a secluded and peaceful setting. Have your wedding ceremony presided over by a Christian Minister and add to the overall wedding experience by incorporating your religious beliefs into your vows for our Christian Wedding Experience. Our Christian wedding ceremonies are timed to culminate in a spectacular sunset experience if done at a beach location, but they can also be done at a forest or farm in the countryside. Combined with the intimacy of the secluded and peaceful setting, this option will make your wedding day remain indelibly etched in your heart and mind. 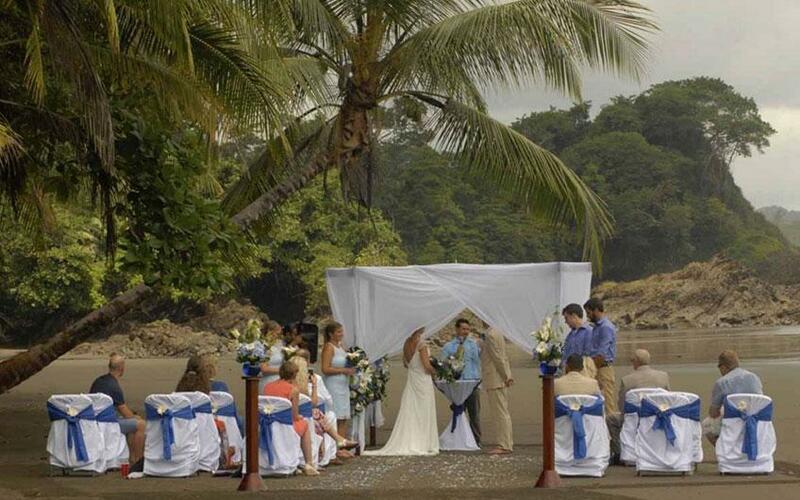 Indulge in a stylish and environmentally friendly wedding ceremony amid the natural beauty of Costa Rica. Allow the breathtaking scenery and perfect sunsets to provide an ideal backdrop for a magical and private ceremony that remains socially and ecologically responsible. Your recollections of this celebration that is both elegant and ethical will be forever etched in your hearts and minds. Our green weddings are timed to culminate in a spectacular experience, creating the perfect setting to say the words "I do", as the warmth of the day gives way to the coolness of a beautiful evening in the tropics. For those who want to opt for a conscience free high-quality wedding that is not only stylish and beautiful, but is also environmentally friendly, then the Green wedding experience is ideal for you. 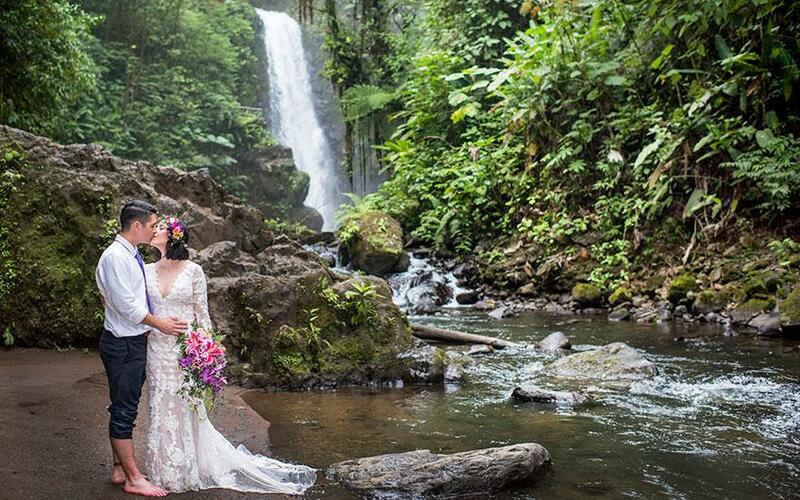 A Costa Rica wedding for two... if what you are looking for is something intimate, simple and romantic, the elopement is the perfect option for you. In one of the most romantic countries in the world, surrounded by magic and beauty of a true paradise, declaring your love for each other in the most important and memorable day of your life. With an elopement-wedding package you can save money and have an incredible time for yourselves. Costa Rica is the perfect place; there are many beautiful and unforgettable wedding locations to get married and to enjoy a great honeymoon full of adventure and excitement. We would be happy to help you plan the most beautiful, unique and romantic elopement for you. A romantic candlelight dinner after the ¨I do¨, traditional live music from a local band, photographer, lawyer, spa treatments, wedding cake; we will be there for you in any step before and during you wedding day. This can be a wonderful experience if you let us work with you, we are experts, just tell us your budget (we will look for the best currency exchange for you) and the things you wish to have and we will recommend the perfect place for a wonderful wedding and unforgettable honeymoon. We know you have been imagining your wedding since long time ago and you want that image in your head come true. We can assure you that your wedding in this paradisiac destination will exceed your expectations and you will remember that moment as the most special in your life! For your wedding reception, we offer private dining under the stars or at private indoor facilities, where waiters will serve you and your guests as you dine by the beach, the countryside or the forest. Whether opting for Typical or International cuisine, you can enjoy a wide variety of different menus ranging from a Costa Rican set menu to a seafood BBQ option or an international a la carte menu. Children's menus are also available on request. Choosing the menu, type of service, drinks and setting is entirely your decision. Special cocktails can be an interesting addition to your wedding day. Served in hollowed out young coconuts or pineapples. Why not opt for the magical sounds of the Marimba or the local dance steps of the "mascarada" (masquerade), as entertainment on your wedding day? For entertainment and live music on your wedding day, you could start with a talented musician playing the piano to greet your guests as they arrive for your wedding ceremony. Then, during the dinner reception, you can opt to have the rain forest creatures (body painted artists characterizing the most important animal species of the forest) welcoming you and your guests. To accompany them, local musicians will play traditional instruments, invoking a magical atmosphere for you and your guests as you dine. After that, you can have a DJ playing the latest chart tunes or opt for some live music with a Latin band, an acoustic trio, a calypso group or a duo of singers to have you and your guests enjoying the night away. To add a little bit of excitement to the evening, you can also have a dazzling display of fireworks, a fire show or enjoy the magnificent sight of dozens of fire lanterns floating up into the sky. Despite having different styles, all the photographers we use for our weddings produce work of a really high quality. For all our wedding packages, the final product can be a USB memory stick or a printed version of all the photos taken or a combination of both, as you prefer. Please note the photos can be couriered to your home address at an additional cost. Video captures the spontaneity of the day in a way that traditional photos are unable to. It also gives you a permanent record of both the sights and sounds you won't want to forget. From a non-religious ceremony to the emotion in your partner's voice as you exchange your vows, a DVD video will forever record the occasion, allowing you to share your experiences with friends and family on your return home. Our professional suppliers offer a wide range of video production services. Using the latest video hardware and software to produce your wedding video, they offer a high-quality product that will make your wedding video stand out from all others. From aromatic steam baths to herbal body - masques, Costa Rica's spas and retreats offer the utmost in rejuvenating body/beauty treatments. The country now boasts of having many excellent spas that can truly be referred to as 'world-class'. These health center/retreats offer excellent wedding packages in total luxury and comfort. Traditional Thai massage, reflexology, yoga, tai chi, aromatherapy and acupuncture are all available, helping relax the body and assisting in rectifying ailing bodily functions. Throughout weddings history, favors have become an important part of marriage celebrations around the world and the tradition of wedding favors can be traced back over several centuries. Brides and grooms traditionally present wedding favors as a way of symbolizing their appreciation to their wedding guests for sharing such a significant occasion in their lives. Wedding favors around the world are as diverse as the cultures surrounding them and we give you a wide selection of unique and tasteful wedding favors to choose from. The following is a list of the wedding requirements for civil marriage of non-residents in Costa Rica. Applies for bride, groom and witnesses. ID: Costa Rica requires a valid passport for foreigners who want to marry and also it is required for the witnesses of the marriage. Neither social security nor driver's license of any country is considered proper identification for marriage purposes. Visa is a migratory requirement. For marriage purposes, this is not required. For most visitors to Costa Rica, Visas are not required. A Birth Certificate is not required since a sworn statement attesting to your date and place of birth covers that requirement. No certifications or authentications are necessary, since the sworn statement covers items that need to be authenticated or notarized. Required data sent along with passport scans 10 days before the ceremony date is recommended and normally sufficient. Two (2) people are required to bear witness. They cannot be family up to the third degree. This means that those who are not allowed to bear witness are (relation to the bride and groom): mother, father, grandmother, grandfather, uncle, aunt, sister, half-sister, brother, half-brother, cousin, nephew, niece, all in-laws, etc. Best for witness duties are friends. 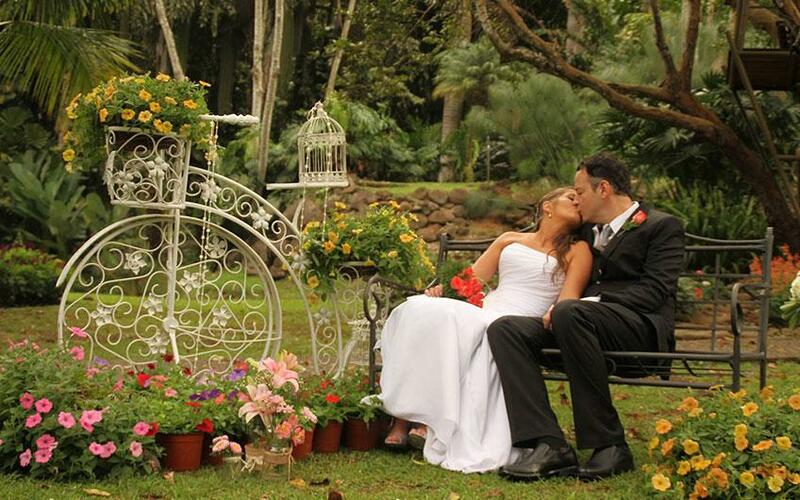 No required stay (permanence) in Costa Rica exists for a valid marriage. Divorces copies are not required since the sworn statement will attest to when, where and from whom you are divorced. All you need to do is send the date, place, name of court that decreed the divorce, and full name of ex-spouse, so that it can be included it in the sworn statement. Woman divorced less than 300 days law: this is an archaic law that is designed to avoid children from a previous marriage to be born in the next marriage, with the consequences for the child that might entail. It basically requires the divorced bride to wait 300 days between the date of the divorce decree and the date of the upcoming marriage. If this is not possible, the bride must undergo two pregnancy tests by two different doctors, have them certify the negative results, have the certification translated by an official translator, and run through the required chain of signatures ending in the Secretary of State (or equivalent, depending on the country), and the Costa Rican Consulate. This must be presented to the officiating notary prior to the ceremony. a) The Certificate of Marriage takes approximately 3 (three) months to process. It is slow due to the sluggishness of the Costa Rican Civil Registry, which takes roughly 11 (eleven) weeks to register the marriage in its books. This is a requirement for validity abroad. b) The Certificate will be sent via courier authenticated by the Consulate of the country to the residence of the couple. c) Once the Certificate is received, it must be registered in the city of residence of the couple. It is best to call city hall, town hall, municipality or equivalent to inquire where marriages are registered, and take the Certificate as proof of marriage. 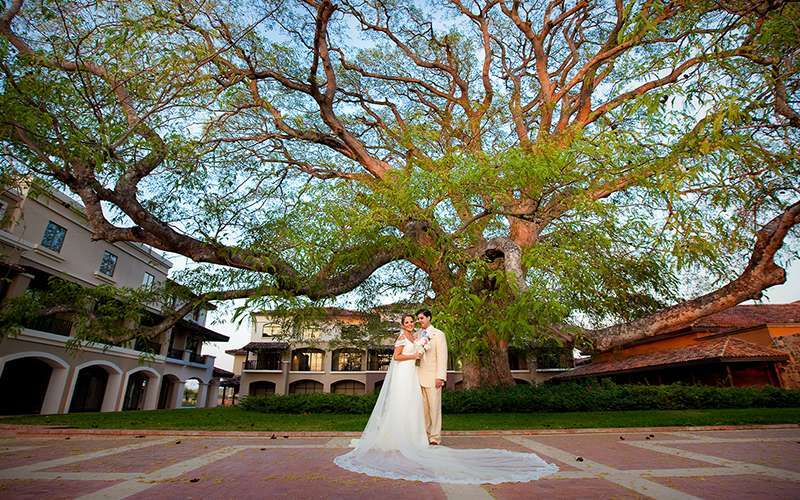 Costa Rican marriages are recognized all over the world. Full name - (first, middle and last; no initials, please). Profession/Occupation - (please describe; for example: YES: engineer, electronic technician, school teacher, broker, assistant in electric company, etc. ; NO: service technician, assistant, assistant manager, strategy consultant, manager, operations manager, etc.). Current address - (street address, please). This should be your home address. Passport number and nationality - please make sure each passport is signed by the bearer. Scan a preliminary copy of each passport (bride, groom and witnesses) to the Lawyer (photo/information page only). Marital status - if divorced, please indicate the date, city and state, name of Court that decreed the divorce and the full name of ex-spouse, no initials please. Note: If the bride is divorced, her divorce date must be at least 300 days prior the date of the upcoming wedding. If not, we will provide further instructions. Date and place of birth - (city, state or province, country). For Groom and Bride ONLY. Full name of Father and Mother and current citizenship - (no initials, please; Mother's maiden name, please). FOR Groom and Bride ONLY. Mailing address - (no P.O. Box) this is the address where the final documentation will be sent. Courier Company requires a street address. Package containing the Certificate of Marriage will require a "received" signature. Phone number - necessary for the courier company (in case they can't find the address). Are you coming alone or with friends? If you bring any friends along, they can be witnesses (except relatives to the third degree). If lawyer or wedding coordinators can make the necessary arrangements. If you do want your guests to bear witness, send the info on items 1-5 on two (2) people of your choice (two witnesses are required). One of the most important things to take into account when you are booking a wedding package is that it includes all the procedures related with the Marriage Certificate. The procedure for a valid marriage in Costa Rica involves the signing of two documents once concluded the ceremony: a sworn statement attesting principally to your marital status, thus avoiding any further proof and the marriage document itself. After the ceremony, you cannot receive a Certificate because first paperwork must be submitted to the Civil Registry of Costa Rica. The whole processing of documents, which includes translation and authentication by the Consulate of your country of residence, may vary but normally takes approximately 12 weeks. Once everything is ready, the Marriage Certificate will be sent, along with instructions, to the address you provide on Item 8. Lawyer and we at Travel Excellence as your wedding planner will keep you updated with paperwork progress, via email, so you know exactly when the documentation is sent. Certification of marriage fee is not included on the amount charged by the public notary. Document needs to be taken to the Consulate of your country of Residence for authentication and each Consulate charges a different fee. For Ex: USA $80 and Canada $120, etc. This might be considered and once we know your country of Residence we will be sending you the cost for each document. Certification of marriage is in Spanish; you can take it to a legal translator in your country of residence. We can also get it translated from here with a legal authorized translator for an extra fee. Depending on the translator and language the document needs to be translated to it make cost extra $150 - $200 and an extra week while documents are translated. Please, let us know if you have any doubt concerning to the process of planning your wedding in Costa Rica and we will more than glad to assist you. This special activity for you will be organized with all the details and care, in order to make it a successful and unforgettable event.